Worshipping God in celebration and awe. have never seen anything like this!" Notice that Jesus is at the center of this biblical account. The people crowded the house to hear Jesus; the paralyzed man’s friends were determined to bring him to Jesus; the forgiveness, the healing, and even the religious leaders’ misgivings focused on the authority of Jesus. At Churchill Baptist Church, we seek to be focused on our Savior Jesus Christ to whom is given all authority in heaven and earth. The four men took a risk and overcame all obstacles to bring their friend to Jesus. They made a plan and executed it with boldness. Where others looked up and saw a hole in the roof and falling debris, Jesus looked up and “saw their faith….” At Churchill Baptist, we will seek to do whatever it takes to boldly and visibly live out our faith. In Jesus’ day, people flocked to hear him teach the Word of God. At Churchill we will seek to cultivate an atmosphere in which people are passionate to hear the Word. We will forthrightly proclaim the truth of God’s Word and the authority of Jesus to forgive and reign over every area of life. Sharing Christ with enthusiasm and creativity… In the spirit of those men who ripped up the roof for the sake of their friend, we, at Churchill Baptist, value the relational component of evangelism in which we are willing to go to extraordinary means to creatively share Jesus with people we know. Friends don’t let friends miss Jesus! At the same time, we recognize that the authority of Jesus and the forgiveness he offers extend far beyond our circle of friends to the very ends of the earth. We will therefore enthusiastically employ all available means to share Christ through mission efforts that reach out to people everywhere. The paralyzed man’s friends wanted to help him. With tenderness and grace they carried Him. With determination and faith they organized, planned, and undoubtedly prayed as they served the needs of their friend by bringing him to Jesus. They knew Jesus wouldn’t let him down, and they weren’t going to either! At Churchill, this is the spirit in which we seek to serve the needs of others. Those who helped the paralyzed man cared about their friend and accepted him in spite of his limitations. They didn’t leave him when “the going got tough.” Jesus loved and helped him too. In his ministry, Jesus attracted a great variety of people and brought them together in one family. It is our intent that this kind of love be characteristic of Churchill Baptist Church as well. 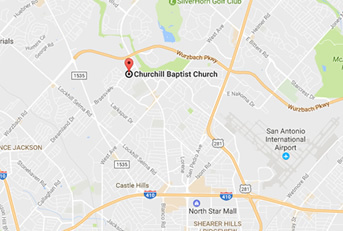 When we worship at Churchill Baptist Church, we seek a first-hand encounter with God. As we witness his power to transform lives, we stand in wonder and reverence of Him. As the people who witnessed the biblical miracle praised God and proclaimed, "We have never seen anything like this,” our prayer is that our worship will continually be filled with heartfelt expressions of wonder, joy, and praise!